For the second year Lance Edwards of Loki hosted the "Heckler Hole" at the Emily Brydon Youth Foundation Golf Tournament... and it's just as hilarious as the first time! Enjoy this video and consider taking part in this fun-fundraiser next fall! More information HERE! Fernie's Shred Kelly's Recent Video - "New Black"
Fernie's Shred Kelly has recently put out a video for its popular song "New Black" off of last year's album In the Hills. We love these guys, we love this album, and we LOVE this video! In 2009 Mike Rousselle, an employee of Arrow Installations had a severe accident on the job resulting in the loss of his right leg and left arm. Not only has he returned to work, he practices martial arts and competes in the Extremity Games... which he won a third place his first year competing and second this year! Truly inspiring! Here is the link to a story we wrote last summer! The morning Michigan sun beat down warm and hard on spectators and dwarfs alike. It slowly rose through the trees and drew razor shadows up from the Michigan University campus. The opening ceremonies were about to begin and beads of sweat formed on dwarf foreheads like the dew on the perfect grass surrounding Ralph Young Field. I was sporting my newly acquired Fernie Fix press pass, moving slowly through the hordes of dwarf athletes taking photos at a machine gun rate. To say I was in awe would be an atrocious understatement. It's August 10, 2013, Lansing Michigan, the World Dwarf Games. Simple but useful tips when exploring bear country! Be safe and enjoy the outdoors this weekend. I was recently visiting an artist friend at the Gushal Artist Residency in Blairmore, Alberta. My friend had built an experimental time travel machine which of course I had to try. Only downside to the machine is you return without any memory of where it sent you. I did however, return adorned in some strange clothing with a taxidermy specimen of a Oreamnos Americanus....mountain goat. (see photo) and have since had a reoccurring dream of a Wilford Brimley type looking evil dude chasing me through an old west town with a fancy hammer. Most disturbing. The morning it became apparent that the Elk River was going to flood, my dad found a fish on the front lawn. It had rained nearly 130 mm in less than 48 hours and water was rushing out from the storm drains in parts of the Annex. My dad put the fish in a bucket and began sandbagging the neighbours’ yards. If you're visiting Fernie this summer, you definitely need to explore Island Lake and all of its offerings! Shred Kelly Announces Summer Tour And Official Video For "The Bear"
Wow, take a look at the busy and impressive lineup Shred Kelly has planned this summer! And it all starts in just a few weeks. 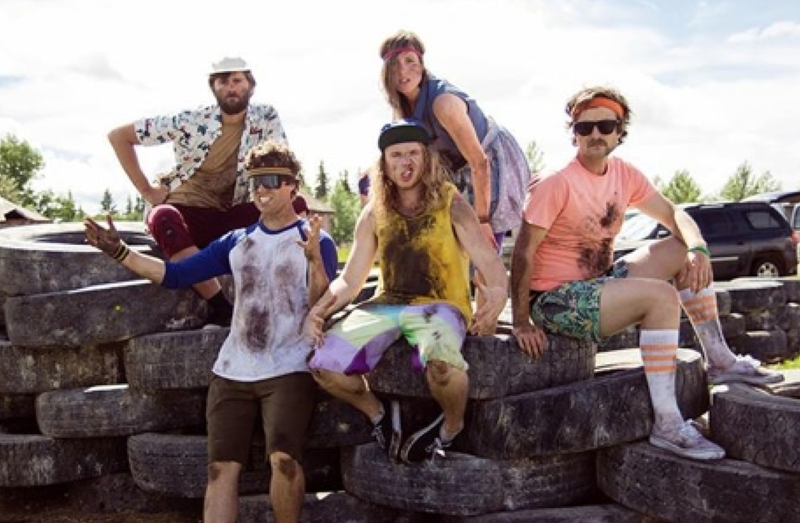 We are stoked to see Fernie's favourite band at Wapiti this August. Enjoy their most recent project, the official video for "The Bear" shot in Fernie this winter by Green Couch Productions. One of the new races coming to Fernie this summer, the Wild Mountain Fernie Enduro is hosted by the TransRockies and will take place June 30, following an ultra running event they are hosting the previous day. With the official opening of Fernie Alpine Resort's summer operations and Canada Day Long Weekend taking place over the same weekend, it really is the perfect time to kick off the mountain bike and overall summer season in Fernie, BC! The burger ring map I am creating has designation rings for up to 7 hours of driving time from Fernie to the particular purveyor of the acclaimed burger. I have gotten in my car and driven up to 7 hours to eat a great burger. I love the road and good burgers. The current winner in the 3-4 hours burger ring is the Brewer's Burger at MickDuff's in Sandpoint, Idaho.